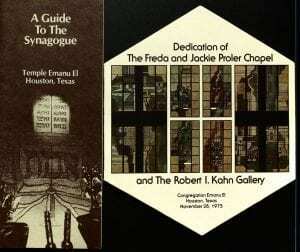 Welcome to the Houston Jewish History Archive’s new blog! My name is Dr. Joshua Furman, and I am the founding director of the archive. Here, you can look forward to reading exciting updates about our collections of South Texas Jewish history, posts from HJHA interns and Dr. Furman about our ongoing work, and updates on the kinds of materials we are looking to collect here at Rice. We’ll also keep you informed about upcoming events related to the archive, and share tips about how you can visit us at the Woodson Research Center here on campus. Feel free to ask questions and share your memories in the comment section below! For more information about the HJHA, or to suggest a topic for the blog, contact Dr. Joshua Furman, or visit our website. This entry was posted in About the HJHA and tagged Congregation Emanu El, Dr. Joshua Furman. Bookmark the permalink.